The Most Rev. Joseph Walsh, Archbishop of Tuam, concelebrating Mass on the 8th September, 1966, at Ballintubber Abbey, on the occasion of the Abbey’s 750th anniversary. The Standing Committee of the Irish Hierarchy at its meeting at Maynooth today had under consideration the implementation in Ireland of the Constitution of the Sacred Liturgy of the Second Vatican Council, in accordance with the result of the Motu Proprio of His Holiness Pope Paul VI, of January 25, 1964. A report from the Liturgical Commission appointed by the Irish Hierarchy last December and reports from different dioceses were before the meeting. Several degrees and methods of utilising the vernacular Irish and English, in the Holy Sacrifice of the Mass were formulated, and these will be submitted for decision to the plenary meeting of the Irish Hierarchy in June. The final approval of these decisions rests with the Holy See. The Standing Committee also considered the application of the new liturgical laws of the Divine Office and the Ritual for the Administration of the Sacraments and the funeral service. It will be recalled that the Ritual which was introduced in Ireland by the Hierarchy in 1958 with the approval of the Holy See, already anticipated many of the recommendations of the Second Vatican Council with regard to the use of the vernacular. Given at Maynooth on 7th April, 1964. Signed on behalf of the archbishops and bishops of Ireland. Archbishop of Armagh and Primate of All Ireland. The following regulations, of an initial character, concerning the use of the vernacular in the Sacred Liturgy, shall come into effect throughout the Archdiocese of Dublin, on Sunday, March 7. Posted in CATHOLIC PAMPHLETS, Mass, Redemption, What is Christianity series? The new version came in from the first Sunday in January 1970 – at least in Armagh Archdiocese. That would have been Sunday 4th January. I clearly remember that the church was packed. We kids had got our new books just after Christmas (probably again in Woolworths!) and I recall that it was quite confusing as we hadn’t done any of the preparatory stuff in school before Christmas. Even the priests made loads of “mistakes” (and at that time it was still common for older priests to lapse into Latin if they got distracted e.g. to say “Dominus vobis… erm, eh… The Lord be with you…”). Nobody laughed in those days, of course! We had to learn the new versions of the confiteor and Domine non sum dignus (we were still told to strike the breast at the correct places – something me and some people of my generation still do) but otherwise the Ordinary was unchanged – until 1975. Cardinal Conway was in charge and was quite conservative, so there was very little, if any, “creativity” on the part of priests. Most of the older priests were also quite conservative so we still had loads of Latin Benedictions, 40 hours, confraternities etc. It really didn’t change until the 80s. It’s still not too bad in my neck of the woods, but the banality is everywhere e.g. no incense at the main Mass on Easter Sunday and the usual flat, boring “let’s get it over with” attitude. No wonder the average age is about 50+! My mother would have been 12-13 at the time of the Congress. She had just started secondary in a convent school where they had a very good choir. They used to take part in Gregorian chant competitions for children and regularly won (now who says that there was no “participatio actuosa” prior to the new springtime in 1965??). Anyway, they had been prepared for months beforehand to take part in the children’s Mass in the Phoenix Park where the “Missa de Angelis” was sung, which was easy peasy to them – she told me they had about 4 other of the chant settings of the Mass which they sang regularly as well as the Te Deum and of course all the well-known ones such as Adoro Te and Veni Creator Spiritus etc. – not to mention the Dies Irae for the requiem. So they went to Dublin on the train, in their confirmation dresses, and processed solemnly out to the Park for the Mass. Just imagine, thousands of kids – all immaculately disciplined – singing the Missa de Angelis! THE PAPAL LEGATE’S GREAT WELCOME! Rory O’Dwyer, a young historian at UCC, recently wrote a very good book on the Congress — which you can purchase here. He has an interesting overview of the Congress in History Ireland here. CLICK HERE to watch newsreel of the Mass. The texts above were first introduced to Irish parishes on the 7th March, 1965. The Ordinary of the Mass remains essentially the same as the 1962 Missal but with the (partial) introduction of the vernacular and the omission of the Last Gospel and Psalm 42 in the prayers at the foot of the altar. The 1965 Lenten pastoral letters of Irish bishops were almost wholly dedicated to explaining the reforms, most were very eager to remind the faithful that alterations to the liturgy involved no change of doctrine on the Mass as Sacrifice. 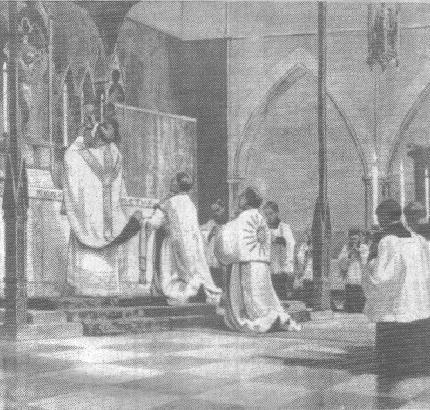 The Vatican Council has spent several years in preparing the Constitution that regulates the manner of offering the holy Sacrifice of the Mass. The Fathers have had only one purpose in view: worthily to re-enact the sacrifice of Jesus Christ upon the Cross. In that unique sacrifice Jesus Christ as Man acknowledged the absolute dominion of God over all creation. He made full reparation for the insult of the sins of men against the Infinite God. He gave adequate thanks to God for all His benefits to mankind. In the certainty of being heard, He entreated and obtained from God every grace that human-kind can need. The following is an extract from a letter published in The Furrow in February, 1973, by JF Foyle. “When things were in Latin, we followed the words in the vernacular in our missals, often pausing to reflect even if that meant not being in line with the priest’s words, though we made sure to be in line for the three peaks — offertory, consecration and holy communion. Sometimes we filled in, in between the peaks, with Rosary-reciting, favourite prayers (often from prayer-books or leaflets). Reading, informal praying and reflecting, in between the peaks, played dominant parts in our Mass participation. We had tremendous scope for using our own individual initiative to fill the in-between spaces. The vernacular changed all that and what was designed to increase our participation in the Mass has, in fact, made it awkward for us to participate to our satisfaction. We were suddenly left without missals and expected to attend to the priests’ words all the time. This ruled out reflecting, as we were kept going keeping up with the words the whole way through Mass. Also, we had little to reflect on — we are far from expert in catching a series of sentences while they are flying. We were virtually forbidden to switch off the words (to reflect or pray via reading or thinking parallel to the priest). It was uncomfortable deliberately switching off, anyway, since the words, being in English, kept obtruding in snatches, something that didn’t happen with the Latin (except with some students of the language, and then only when words were said specially loudly). We felt obliged to attend to English words, whereas it was optional with the Latin. We felt inferior at being unable to attend, whereas we felt superior when we succeeded with the Latin. This was, and is, a far from pleasant Mass experience. It also resulted in the three peaks ceasing to be peaks in the Mass — they are just parts of the series of words, almost, often (especially the middle one) passing unnoticed, as our minds wander. What this suggests is that the liturgists equated the scope for being aware of what was being said with scope for participation. Apart from the Latin allowing for similar awareness (even for illiterates), the equating erred in wrongly estimating the strain going with non-stop listening. It did not allow gaps for reflecting, nor for having another look at the words for that purpose. Nor did it recognize that participation is very much an individual matter, made-up around the priest’s Mass words but not rigidly tied to them. The Latin facilitated such individual participation. The vernacular hinders it. Liturgists ought to have been aware of such effects of the change-over, since they were predictable from awareness of how those in the pews participated in the Mass. […] Those in the pew automatically, now, mind-wander most of the time when subjected to amplified voices in churches or halls. Their recall of things said in the liturgy of the word, for example, is nearly nil most of the time, just as their recall of newscasts and radio-television discussions is very fuzzy. Further, Mass is now attended with very little forethought about the theme of the liturgy and even less afterthought about it. There is little time for thinking about religion, anyway, and seldom is a special attempt made in advance of Mass. Getting there quickly by car lessens the scope for forethought, too. Watch the aftermath — as everybody rushes for cars and papers to provide food for some other kind of thought. The Mass words are part of the pattern of information flow which envelops us daily. They get even less attention than the other words, since so few have them in print for fore and after thought. This has contributed in no small away, I find, to very, very little reading about things spiritual. The taking-away of the missals (or their too slow replacement, which amounts to the same thing, in effect) broke the habit. And it is well and truly broken, now. […] Those of my generation who believe in the power of the Mass, and in it being a mortal sin not to participate in Sunday Mass, keep going on that account. It is in spite of the vernacular, not with its aid. The Mass: What is it? The Latin Mass Society of Ireland are holding a seminar for priests interested in learning to celebrate the Extraordinary Form of the Roman Rite or who would like to do a revision course in the basics of liturgical Latin and formation in the rubrics. The seminar will be conducted by Fr Simon Leworthy, FSSP, in Ards Capuchin Friary, Cresslough, Co. Donegal on Wednesday 20th – Friday 22 October 2010. The cost is €110, which includes full board. Those interested are requested to contact Pronsias at 074 97 37307. “It is well known”, writes His Grace the Archbishop of Tuam, “that various printing presses in Great Britain daily pour out a flood of infidel and immoral publications, some of which overflows to this country. We have a confident hope that the Society’s (C.T.S.I.) publications will remove the temptation of having recourse to such filthy garbage, will create a taste for pure and wholesome literature, and will also serve as an antidote against the poisons of dangerous or immoral writings”. St. Patrick was born around the year 397, and when he was but 16 years of age he was seized upon and sold as a slave to a man in the County Antrim. It is believed he spent his six years in slavery, as he was taken captive more than once. Who can conceive his sufferings and privations during those six long years? A noble youth, who had been brought up with the tenderest care, and who had been accustomed from his earliest infancy to the enjoyment of all that could render life pleasant and happy – for we must remember that St. Patrick was of distinguished birth – is suddenly torn away from his parents and friends, and is sent into slavery to tend cattle in the far north of Ireland, There he has no one to help or to pity him, and he has to bear the greatest trials and sufferings; but patiently and bravely did he endure all.